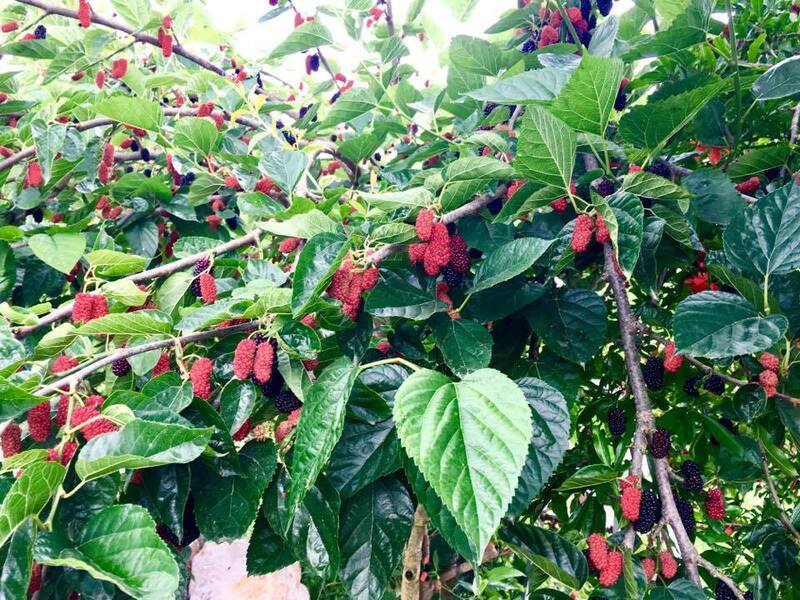 When there are too many overburdened mulberry trees around, they cannot be left groaning. Something has to be done to relieve them of their heavy load. These exhausted trees need help. Their limbs are groaning and they are begging you to help them once again stretch up to the skies! I am hoping you will be raring to go…. get those gloves and old clothes on, and go save a tree!! 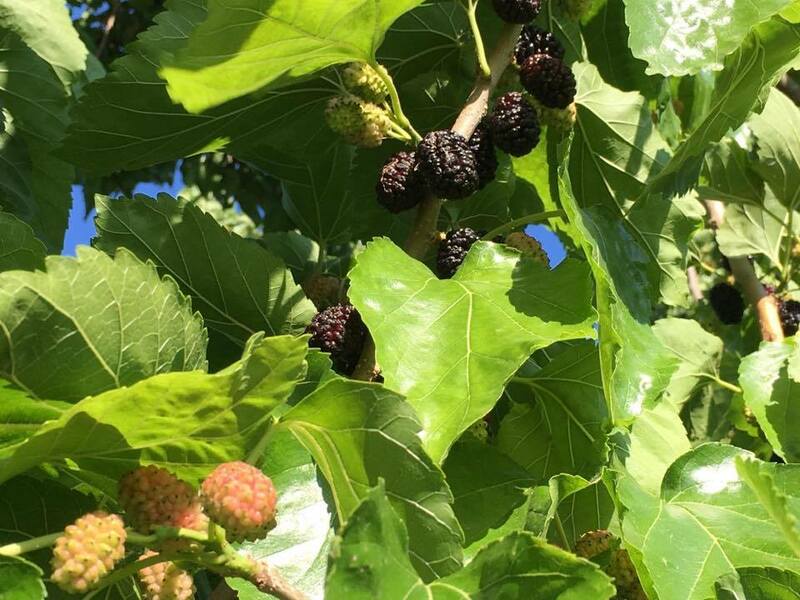 This is the more common elongated Mulberry which is found all over the Fethiye locale. This tree was planted last year. It has one branch and was bowed over badly with the weight of its load! I generously stripped it before thinking to take a photo. I am telling you, after discovering Mulberry Butter it certainly has changed our outlook on life…well at least our look on late Spring. Diving into the mulberry butter jars is just about our favourite thing to do at any given meal at the moment. 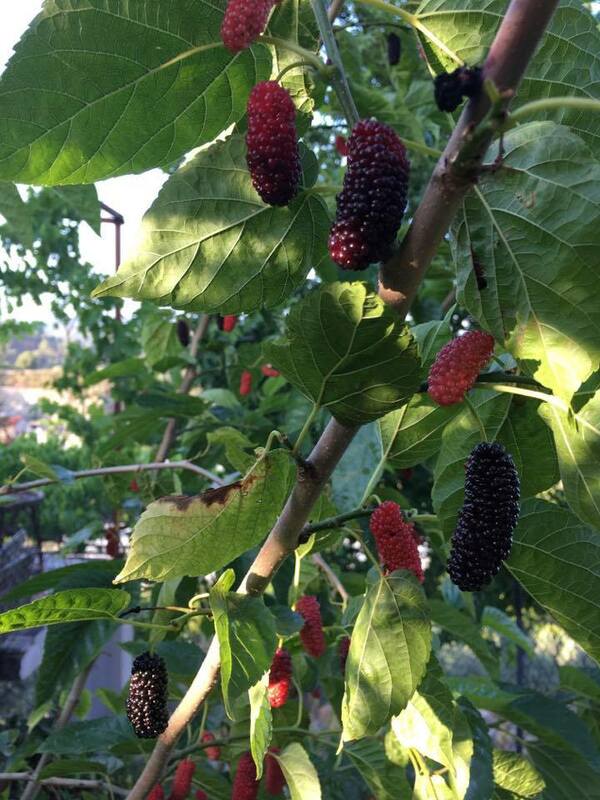 This is a shorter, stubbier version mulberry that is not quite as common in our area. This mulberry happens to be my favourite with a slightly stronger flavour. If you are able, spreading a cloth (that will bear the stains forever afterwards) or sheet of plastic below the tree and shaking the tree is by far the easiest method. I did say above to put gloves on, but in the heat, that might just be too uncomfortable. Playing around with mulberries and testing quite a few different recipes, I feel the Mulberry Butter recipe printed below really hits the spot. Spread thickly on a slice of toast, with or without labne or cream cheese or else dropped onto pikelets, pancakes or blinis, with a dollop of yogurt…is truly superlative. I have to say, it’s definitely worth trying. This recipe really should not be overlooked as long as there are a few mulberries begging to be picked. The season is prolonged by the fruit all ripening at different times. Nature can be clever! There are still a few weeks left to go find a tree in fruit and I implore you to get out there and search! This Mulberry Butter is a real treat and better still, you can be eating it within 90 minutes of picking the fruit! It will still be warm at that stage. It’s just great, hot or cold. Mulberries are quite sweet so I suggest adding the least amount of sugar first. This Mulberry Butter is best not made too sweet and kept a little tart. The lemon juice sets it off beautifully and I urge you to keep tasting it and adjusting the sweetness to your liking, before you add the eggs. 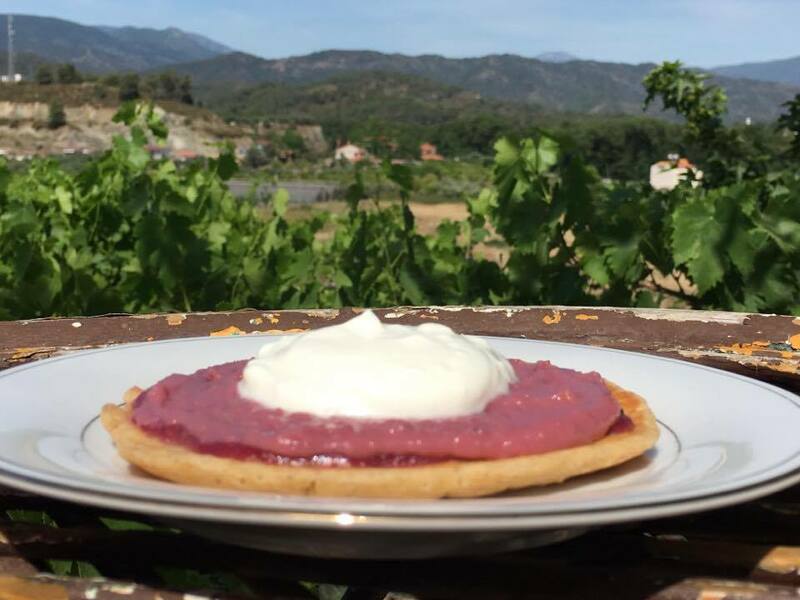 Kefir Blini with Mulberry Butter and a dollop of yogurt. The yogurt offsets the sweetness to perfection. It’s a true match made in heaven. 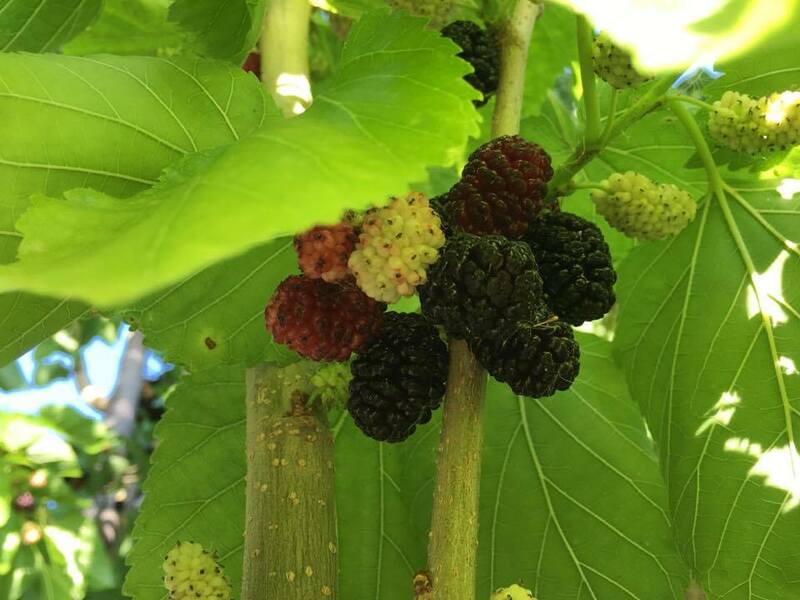 The first time I made this recipe, I had picked mulberries of the round variety which I now understand have far more seeds and their pulp is thicker. When making the puree, ready for the next step to make the butter, I was left with a copious amount of seeds, stalks and flesh that refused to pass through the sieve. Hence 750g gave me just over one cup of mulberry juice and puree and I was left with such a lot to throw to the chickens sadly….. but they did love it! 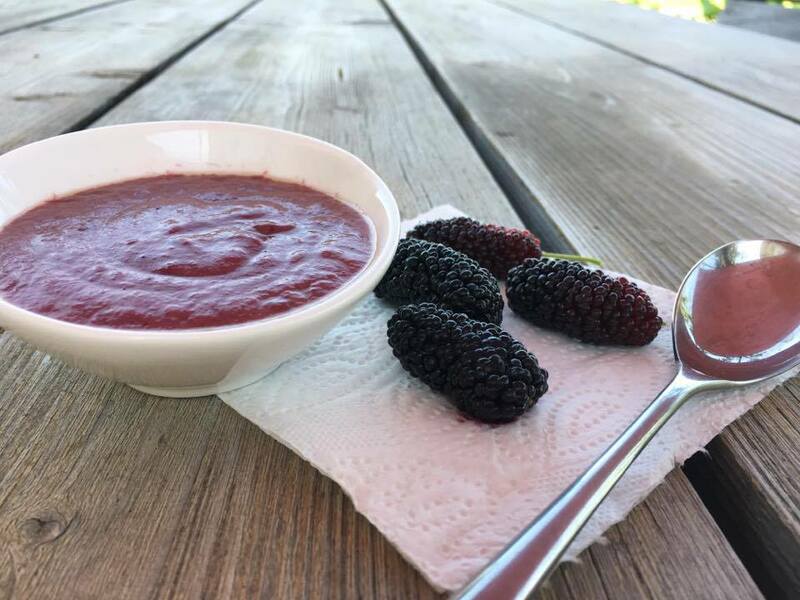 The long mulberry variety are more juicy and hence, there is less pulp and more juice when pushing the cooked fruit through the sieve. For this reason, you need to be aware of which mulberry you have chosen. 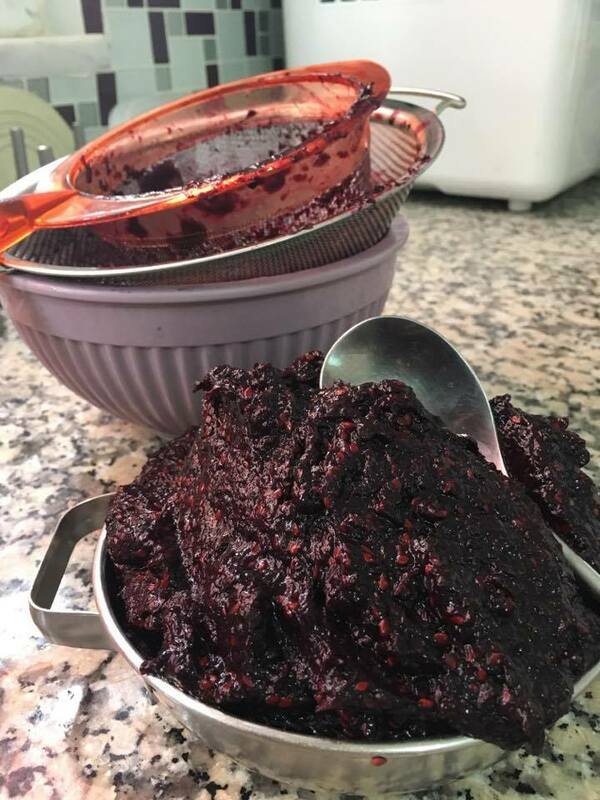 Once you have boiled the mulberries, you need to mash them to extract the juice. 1 and a half cups of liquid is ideal but the recipe still works with just 1 cup. Ideally you need 1 and a half cups of mulberry puree for this recipe. If you only have 1 cup puree, do not change the amounts within the recipe. Makes a medium sized jar. Place the pulp in a sieve over a bowl and work it through the sieve. Will keep 10 days in fridge but I bet the jar's empty within a few days! We found there were a few delicious accompaniments to Mulberry Butter. However, it’s probably a truer statement to say that the list is close to endless. Our current favourites are the Kefir Blinis which can be made with plain yogurt if you don’t have any kefir on hand and the other is Cinnamon Bread. Another idea is to make a Mulberry Pie. I would add an extra egg yolk (added at the same time as the other eggs) to the Mulberry Butter recipe to make sure it sets really well in the pastry and is easy to cut. One recipe amount should fill a 9″ flan tin lined with your chosen, previously baked pastry. Left to set and then chilled, it can be served with cream or ice cream, but for us, our choice would be plain yogurt to offset the sweet mulberries. This Cinnamon Bread recipe is for those lucky enough to have a bread maker. It is a very simple recipe that has guests begging for the recipe, so I thought I would include it here today. We served a slice of cinnamon toast, covered with a thin layer of labne and topped with Mulberry Butter. 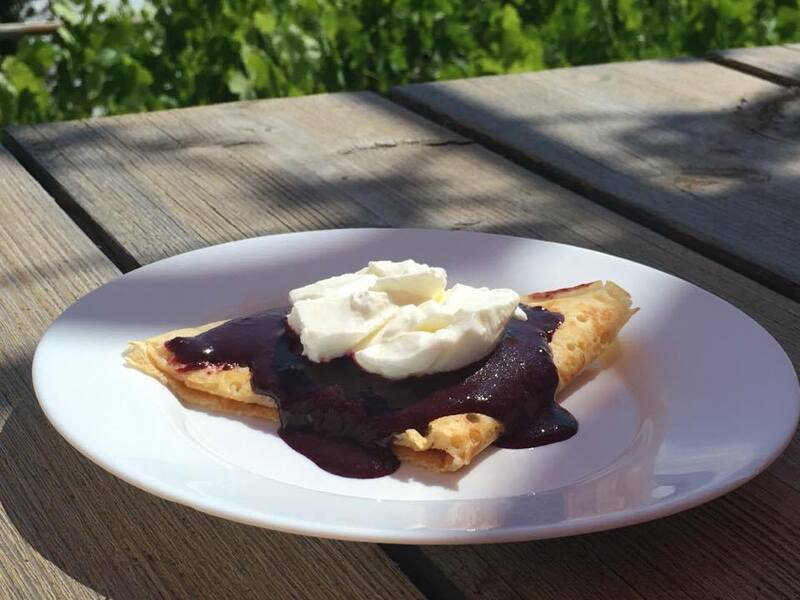 Our friends who were visiting, own a highly popular restaurant and asked for the recipe … so I feel pretty good about sharing it and hope you will enjoy it as much as they did. Slice when cool if you can resist waiting! Suggestion: Toasted cinnamon bread with either labne or cream cheese thinly spread and a layer of mulberry butter spread on top. Heavenly! I really hope you will enjoy these recipes as much as we do. They are a late Spring staple for us. Unfortunately this has to be kept in the fridge and sadly has a short life span which I do not know how to expand. You could experiment with freezing some but I worry that the texture might become lumpy and unpalatable.